Many folks have their own websites these days. Buying a domain and getting a hosting plan are not that expensive these days. In order to transfer files from / to your server, you will need a FTP manager though. There are many free and quality ones available for desktop computers. FTPManager happens to be one of many tools you can use to manage your files remotely on your tablet. FTPManager gives you access to your remote files on your iOS devices. You can read files, play music, and edit files. The app has a built-in file server, which means you can use it to transfer files between your computer and iOS device over WiFi. You can view FTP logs, sort files, edit files directly, and do all kinds of neat things with this. 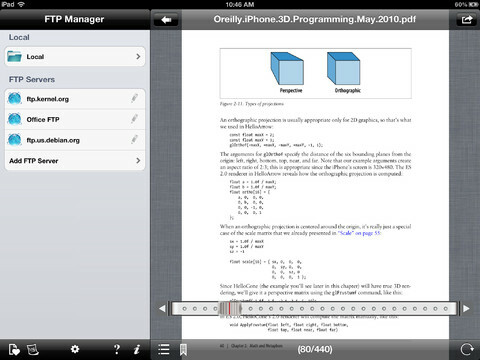 Built-in file readers to handle photos, music, and video are included. 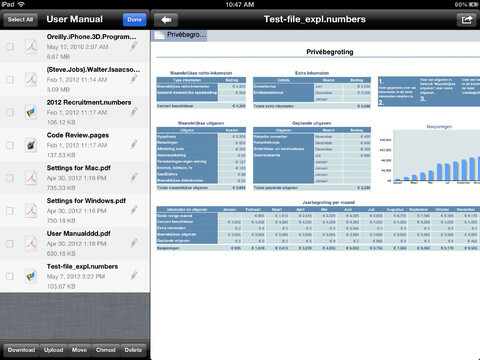 FTPManager is optimized for the new iPad but works fine on iPhone too. Whether you want to transfer files, open them, or make edits directly, FTPManager has you covered. The premium version costs you $1.99.